We've all heard friends (or ourselves) complain that they look and feel like "a beached whale", particularly after one of those evenings (we've all had them) that include a pint of B&J, extra-cheese and pepperoni pizza, and a bottle of wine. However, I have come to the conclusion that I never have to worry about looking like a beached whale. No, my metabolism hasn't turned into a miracle machine nor have I found a new sensational diet pill...rather, I've seen a beached whale, and it would take a lot more than an extra-large pizze to make anyone that big! All joking aside, Ventura and Santa Barbara Counties are experiences a "whale" of a problem; 3 blue whales have died in the area in the last three weeks. Blue Whales are considered engangered species and the number of recent deaths has officials worried that there is an event affecting high morality. 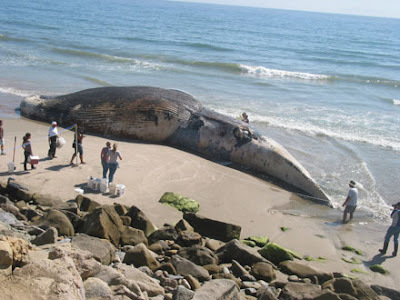 While scientists are claiming the whale deaths are a result of the 170,000 pound creatures being hit by ships many wonder if it they unusual number of deaths has anything to do with the navy's recent practice of sonar testing in the area. Anway, be sure to keep your ears and eyes open for more whale deaths. If this problem persists we may have to take some action! (Particularly because beached whales = flocks of hungry sharks = me scared of lossing a toe while surfing.) Also, remember, never compare yourself to a beached whale - it isn't good for the self esteem and it isn't even close to being true!